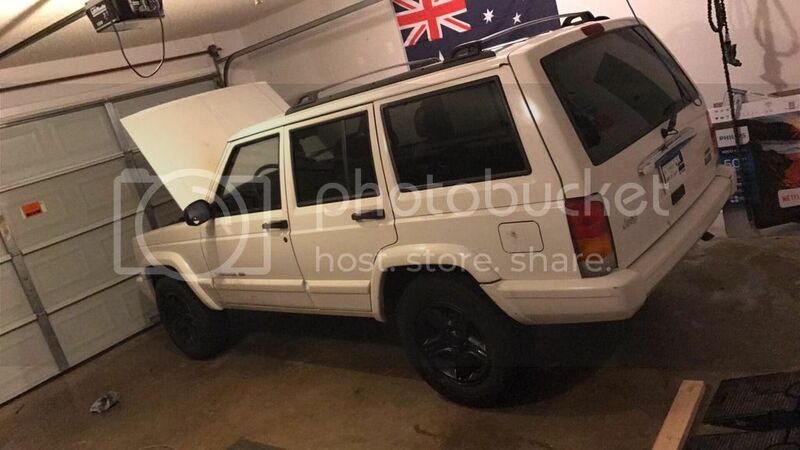 10 years ago, 16 year old me desperately wanted a Cherokee as my first car, but I couldn't find one for cheap enough and in good enough shape with all the options I wanted etc. I gave up searching and bought a blazer instead. Fast forward 10 years and 8 cars later and I've moved from the Northeast to Central GA and rust free Cherokees are everywhere. I started the search looking for a good running 4WD model. I prefer manuals but knowing they are hard to find I was open to an automatic. 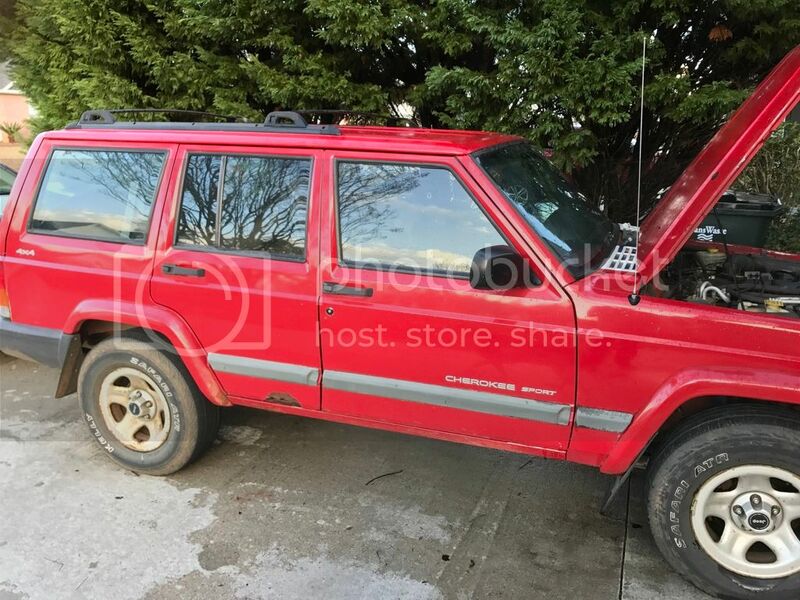 I came across a Cherokee on Craigslist that I thought would be perfect. The ad didn't have much listed and the owner only listed his email. I didn't get much info on it through that, but I was able to go take a look at it and cue the dissapointment.... It was a RWD. Also the "minor work needed" included a melted engine bay form a fire.. I left with my head low but kept searching. A week later I found another 4 door, but this one was listed as a 4wd, and a manual! Once again I hopped in the car and drove the 45 minutes down to see the car. When I got there the owner disclosed the "minor rust issues". This thing was about ready to fall apart. At this point, I hatched a plan. What if I bought both Jeeps, and combined the best parts of each? 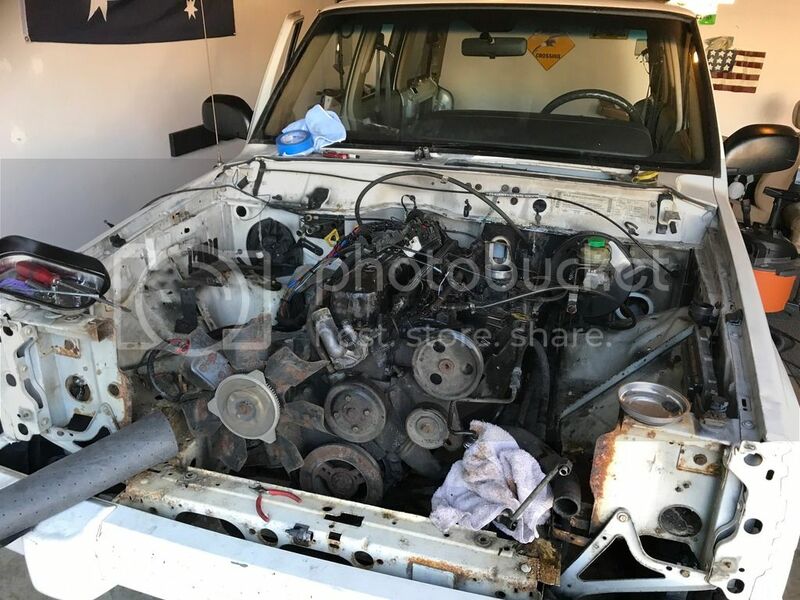 Take an incredibly clean body and mate it with a working Manual/4WD setup? after a day of deliberation, I bought both Jeeps for a total of just $1400. Now begins the process of turning to lemons into the Cherokee I've always wanted. So work has already began but here are the first pictures of both Jeeps. First off, here is my donor car, a red 2000 Sport with 180k. And here is the Jeep all of those parts are going into, a 2000 Cherokee Limited with 150k. Being a limited, this XJ comes with tan leather interior, xfinity stereo, and chrome accents. Not sure how I feel about the chrome so it may or may not stay. The first step was figuring out what aside from the drivetrain I needed to steal out of the red Jeep. So far that has amounted to a door handle, roof racks/rails, stereo, and various other odds and ends. I was pleasantly surprised to see that the stereo went right in (there was a zj or wj stereo smashed in there) and functioned perfectly. The only problem I'm having is that the door speakers aren't gettign any power. Not sure if the problem is in the headunit, amplifier, or wiring somewhere. The lock switch on the passenger front door had broken off so I swapped the whole assembly from the donor jeep. I replaced the melted plastic rivets that orginally held it in with a couple screws and we were good to go on that. Under the roof racks I found some nasty bubbling around the bolt holes so I wire wheeled it down as best as I could and touched it up with some primer to help prevent any further rust. The crossbars were in bad shape so I stole those off the donor car in addition to the rails and all the mounting hardware. I'm starting to learn that while the red jeep was pretty well taken care of by its previous owners, the white jeep has probably gone through a few different backyard mechanics in its life. Every time I remove something it seems to only be held in with half of its bolts. The front clip was missing all but two of them! The drivers seat was also only held in by 2 bolts. Speaking of that drivers seat, I don't really want a power seat in an offroad rig, so I ditched the power seat rail in favor of the manual one in the donor car. I had to sand down and respray the base as the feet were getting some surface rust on them. Started stripping down the engine bay in the White Jeep. It will be a little while before I can actually pull the motors and start swapping, but I'd like to get everything prepped so when its time I can just go. Right now I'm trying to get a hold of an engine crane I can borrow for a week or two. The garage is getting pretty full with all the parts I've taken off. Trying to keep everything organized is the most difficult part! 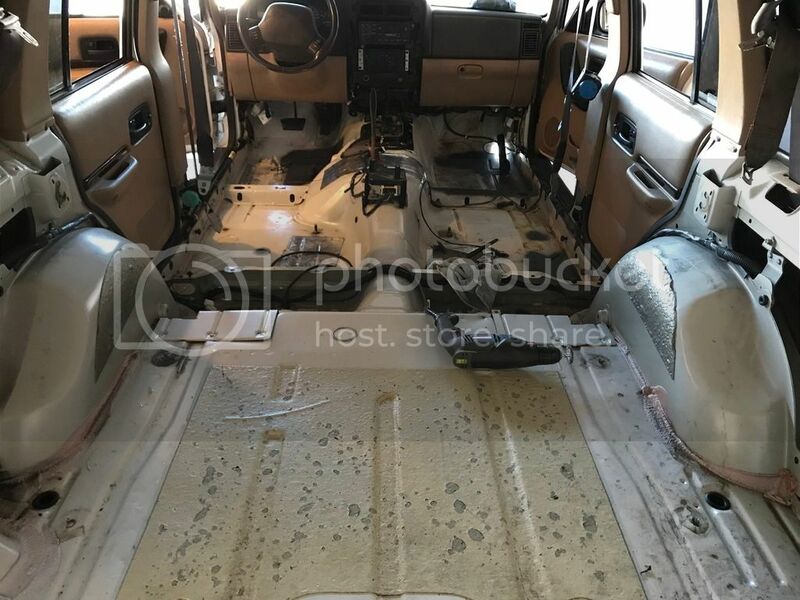 I've also finished the project of stripping the interior. I'm planning on bedlining the floor as my carpets are in rough shape. They smelled pretty bad and when I pulled it all out I found out why. Not sure where the water came form but they were soaked! I'm guessing its form a window seal or something. 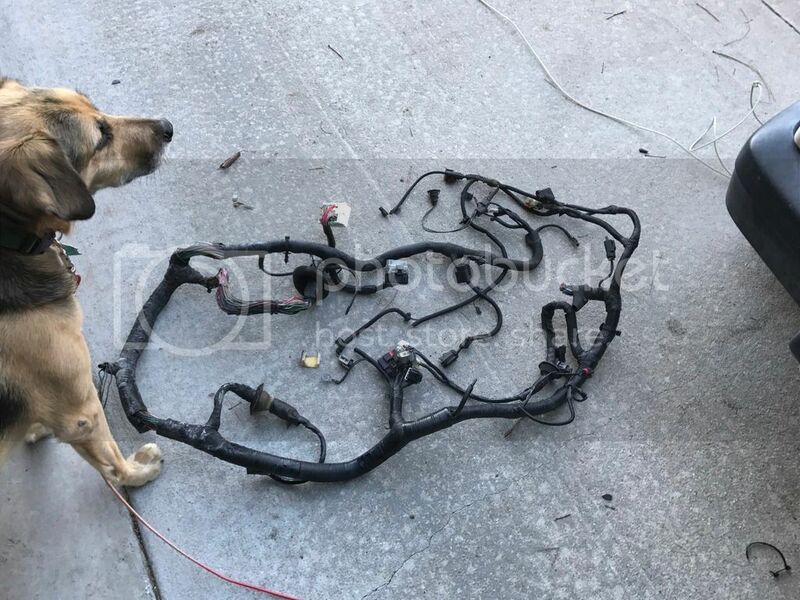 Doesn't smell or look like coolant so I don't think its from the heater core. The rear window washer also works fine so I don't suspect that line. I sanded down any surface rust I saw down in the footwells and primed it to prevent future rust. First off, welcome to the beginning of an addiction. Looks like you are off to a good a start! Glad to see another future white 5-speed. Its the best combo out there. Seeing that they are both 2000s, do you know if either head has been replaced? I am assuming you know about the 0331 head issue? Seeing that they are both 2000s, do you know if either head has been replaced? I am assuming you know about the 0331 head issue? Another option I've been considering is taking one of the motors and tearing it down for a full rebuild possibly with a stroker kit? It's a lot of work to pull the engine a second time, but right now the money isn't really there for something like that. The good news is that right now both engines show no signs of any issues with water/oil mixing. Last edited by Matthew Reed; 01-13-2018 at 03:43 PM. Some progress has been made! The interior is now stripped as far as I need it, and the engine bay isn't too far behind! Next step is to finish stripping everything out of the engine bay (including the engine) so I can sand it all down and respray it. The fire took off a good amount of the paint and I really don't like the idea of leaving it all bare, especially when I'm going to have everything out anyways. SO far I haven't run into any problems, so fingers crossed that will continue once I start swapping out suspension and engines. Congrats on your recent purchases and projects. 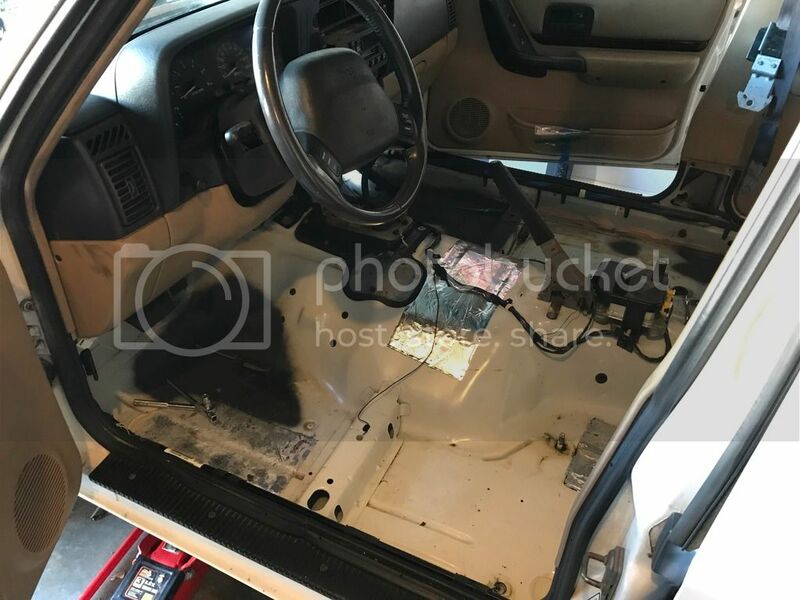 I see you had the dreaded interior problems much like a lot of us. Lucky for you it seems yours in good shape mine had bad rust where I have to replace entire passenger floor boards. Good luck on future build of your XJ! What is your ultimate plans with the end result? Yes, it looks like I caught it early enough that it didn't cause any real damage. The end goal for it is to be a capable off raider for weekend excursions but still be streetable to use as a second vehicle. My daily is a 2014 Fusion but I've been putting a lot of miles on it. I also don't like taking the dog around in it or taking it camping/hiking. Speaking of duture goals, I just ordered a 3" lift kit. I went with a rough country lift. Decided not to do the full leaf springs as the ones on my jeep are in pretty good shape so it'll just be add a leafs for me. Looking forward to watching this build progress. I am down by Savannah Ga.
Good plans and defiantly looking forward to your progress and end result. Well when it comes to Jeeps they are never done lol. That's why it's called a project!